Snaffle was an attempt to boil down an online travel business model to the absolute bare minimum - instead of offering discounted bookings, offer just the discounts, without the booking part. It's the booking part that is expensive to build, after all, and complex to integrate with thousands of suppliers. We decided to offer local discounts for nearby shops, restaurants and suchlike. For a retailer it was a great way to target nearby people, and for the customer a straightforward money-saving idea. After talking to every business in a 1-mile square around our office to estimate take-up, we partnered with Ben and Julian at Vouchacha, who were setting up essentially the same model. It was an idea very much of its time - Groupon launched during our development phase - as did a host of others - although their model was aimed a bit differently. 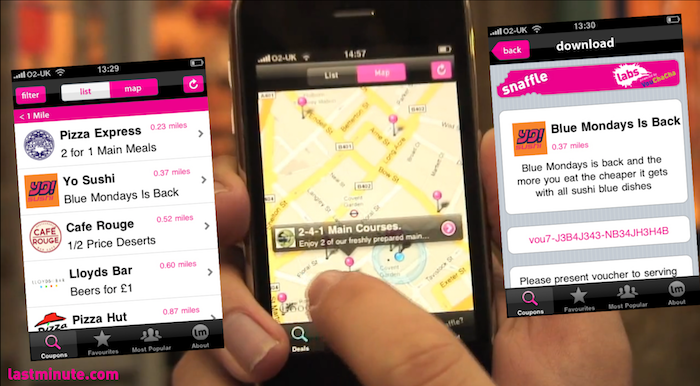 We trialled snaffle with an iPhone app and a number of retailers in London's Covent Garden area, promoted it locally, but to be fair this was an idea that needed a critical mass both of customers and retailers. In a classic catch 22 situation, we needed a successful trial to persuade the top brass at lastminute.com to support this disruptive model, but we needed them to support it to ensure a successful trial at a large enough scale. Unfortunately we never made it out of the starting gates.